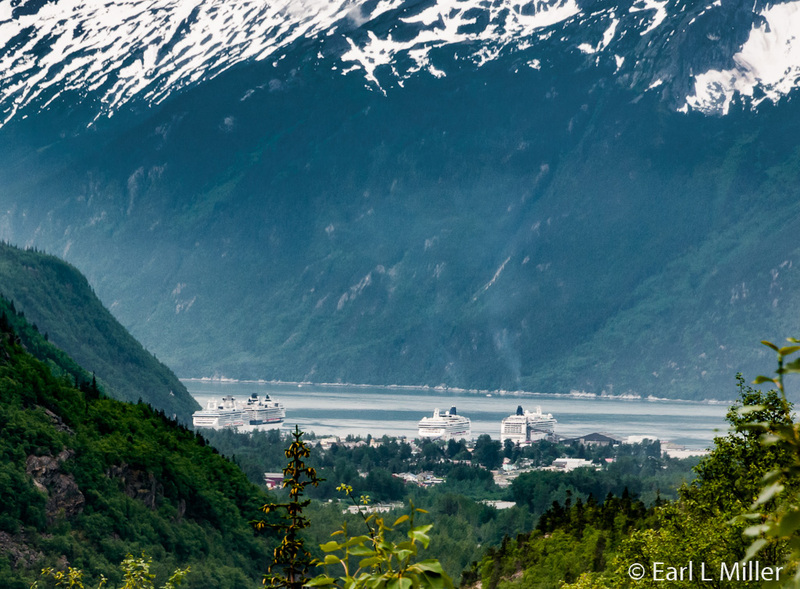 Our last port on the Millennium was the historic town of Skagway. The Klondike Gold Rush rapidly changed it from a tent town to a peak of 10,000 during the late 1890's. Today many of these buildings still exist and strolling the various streets is a step back in time. I was surprised that Millennium offers 40 different tours at Skagway with several of these provided at two or more times during the day. On those going to Canada, you’ll need a passport. Two helicopter rides are combined with glaciers with one including dog sledding. Wildlife options include a wilderness river adventure, going to an eagle preserve, or heading to a wildlife refuge to see many species. You can also check out the local wildlife via a high speed boat. Want to be active? Select from twelve tours - everything from rock climbing and rappelling to bike tours, horseback riding, and ZipLining. You have a choice of several hikes. On a trip to Haines, golfers can play the Valley of the Eagles Golf Links. Some are gold rush oriented. 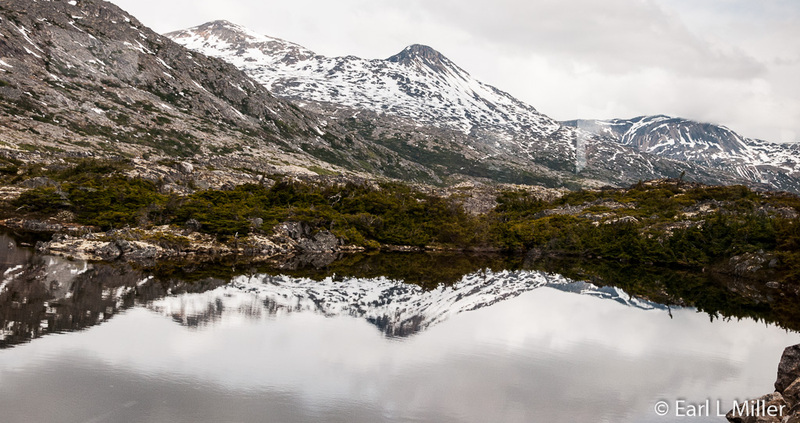 One involves a hike on the Chilkoot Trail while several go to Liarsville Gold Rush Camp. 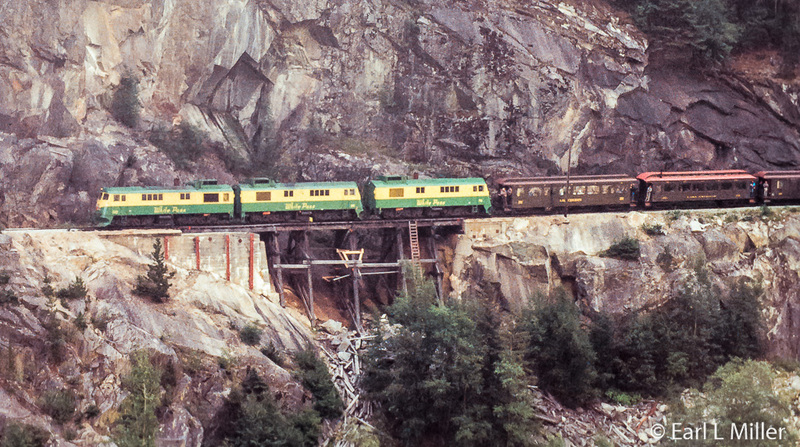 A number of White Pass Scenic Railway trips are offered. 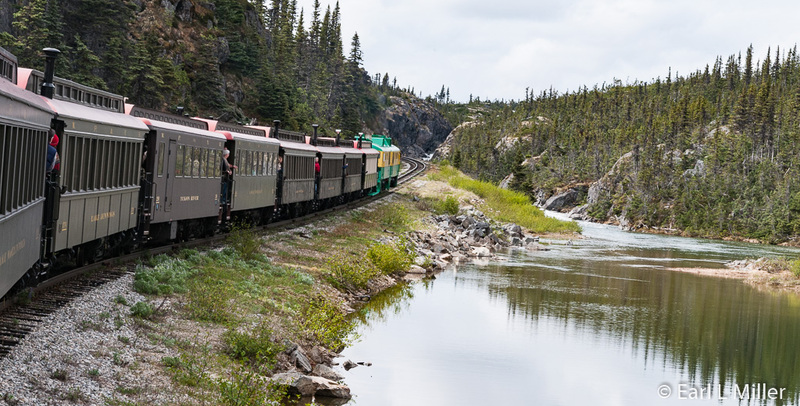 These include taking a ride up on the train and returning via the bus on the Klondike Highway, continuing on the train to the Yukon, or combining it with dog mushing. 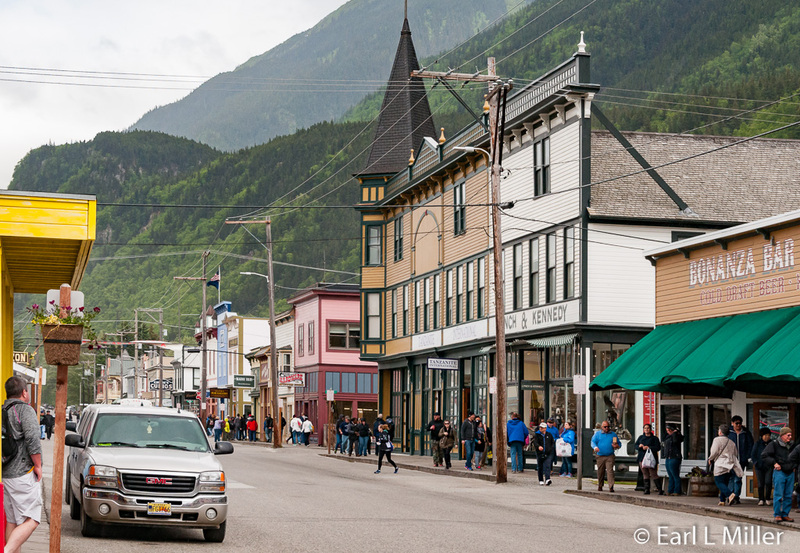 You can explore Skagway’s sites via a 1927 vintage street car or take a walking ghost tour. One tour lets you experiment with glass blowing. We had originally chosen the Gold Rush Sled Dogs and White Pass Train Adventure which lasts 5-1/2 hours. But we decided to take the White Pass Scenic Railway 3-1/2 hour trip instead and devote time to a stop at Klondike National Park headquarters. This railway has quite a history. In 1994, it was designated as an International Historic Civil Engineering Landmark. Sites such as the Statue of Liberty and the Panama Canal share this honor. It was built due to the gold rush which lasted from 1897 until 1899 when prospectors abandoned the Klondike and headed to Nome. The search for gold in Alaska and Canada had gone on for two decades. In 1896, George Carmack and two Native Americans, Skookum Jim and Dawson Charlie, discovered gold in Bonanza Creek in the Klondike. They only found a few flakes, but it was enough to trigger a gold rush. 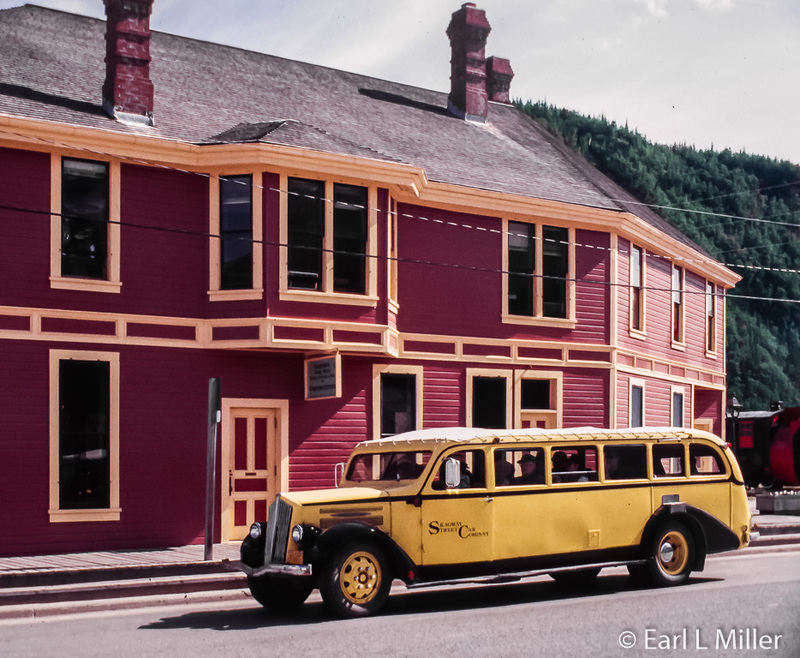 A Canadian survey party hired William Moore, Skagway’s founder, whose home you can visit today. He and Skookum Jim discovered an alternative to the rugged Chilkoot Pass. They traveled 45 miles to Lake Bennett, near the Yukon River headwaters, and named the new route, White Pass. Moore returned home where he built a sawmill and a wharf. He felt a railroad would be built to the lake and that it was time to prepare for a gold rush. On July 17, 1897, the Seattle newspaper reported gold in the Klondike when 68 prospectors arrived on the Steamer Portland with almost two tons of gold. Men and women, by the tens of thousands, streamed up the Inside Passage waterway, arriving in Dyea and Skagway. Some continued to choose the shorter but steeper Chilkoot Trail that began north of Skagway in Dyea. The trail was tough because pack animals couldn’t be easily used on the steep slopes leading to the pass. In late 1897 and early 1898, tramways were built. Until that time, stampeders had to carry everything on their backs. Others selected the longer, less steep White Pass Trail which Moore had blazed. It was an animal killer with more than 3,000 horses dying on this trail. Horses, gleaned from the Seattle glue factories, were purchased at the Skagway dock for exorbitant prices. Prospector overloaded and beat their pack animals then forced them over the rocky terrain until they dropped. Some horses died of starvation; others drowned. By the middle of summer in 1898, 18,000 people were at Dawson with more than 5,000 digging for gold. By August, many of them headed for home with little money in their pockets. In 1899, a still larger exodus headed to Nome where gold was next discovered. Skagway and Dawson City started to decline while Dyea disappeared altogether. 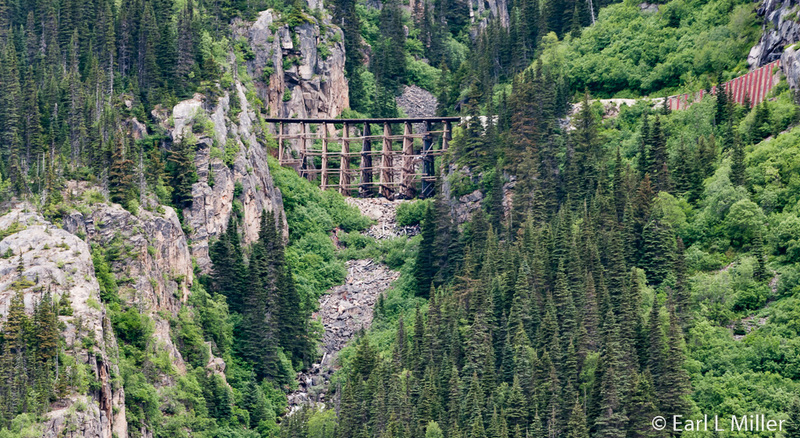 George Brackett, a former construction engineer on the Northern Pacific Railroad, built a 12-mile toll road up White Pass Canyon. Since his toll gates were ignored, his road was a failure. William Close, a London investor, sent three railroad men: Sir Thomas Tancrede, John Hislop, and Erastus Hawkins to scout the location of building a railroad through the White Pass. They met with Michael J. Heney, an experienced Canadian railroad contractor, in April 1898. Heney convinced them the job could be done and that he was the right man to do it. 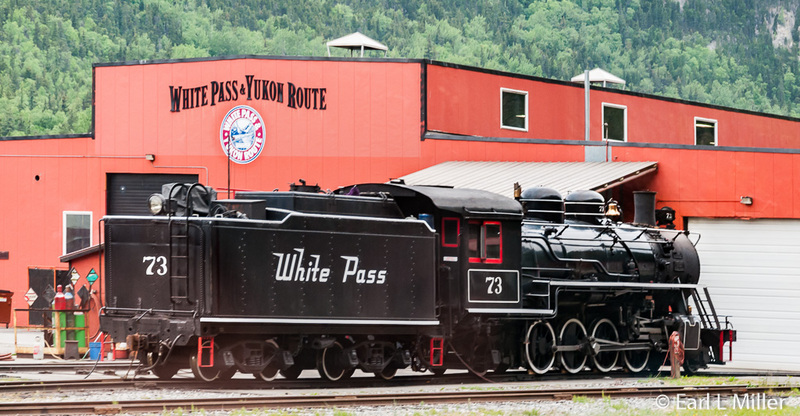 When the White Pass & Yukon Railroad Company organized in April 1898, it paid Brackett for the right-of-way to his road. On May 28, 1898, the railroad started construction. It took the company ten million dollars from William Close and his British investors, 26 months, and 450 tons of blasting powder to complete the job. 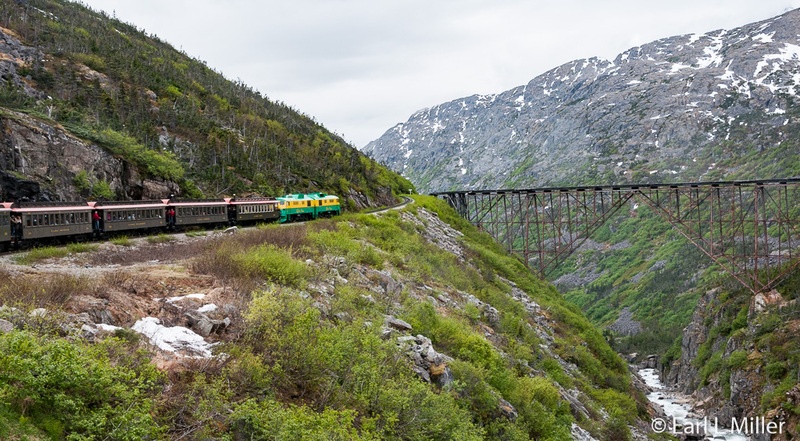 Building the 110 miles of narrow gauge track, connecting Skagway to Whitehorse, the Yukon, and beyond to northwest Canada and interior Alaska was a challenge. Narrow gauge has a width of three feet compared to standard gauge which measures four feet eight and one half inches. It cost less to build and allowed for a sharper turning radius than standard gauge. The route ascended from Skagway to almost 3,000 feet at the Summit in just 20 miles. It featured steep grades of almost 3.9%, cliff-hanging turns of 16 degrees, two tunnels, and numerous bridges and trestles. By July 21, 1898, the first four miles were complete and service began. The WP&YR was the northernmost railroad in the Western Hemisphere. The Summit was reached on February 20, 1899, and by July 6, 1899, the track was at Lake Bennett. Two construction crews worked on the project. One came north, the other went south, meeting in Carcross on July 29, 1890. On that day, Samuel H. Graves, the railroad’s president, drove a golden spike into the ground. It had been the construction project of 35,000 men. Many of the men who worked on the railroad were prospectors earning enough to grubstake their way to the Klondike. Unfortunately, by the time the railroad was completed, the gold rush’s peak had passed. 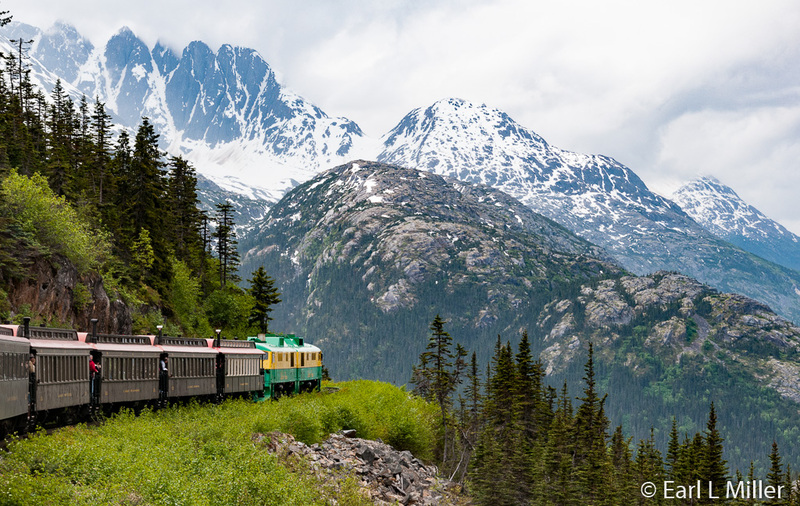 For many years, the railroad carried large amounts of ore and concentrates to Skagway which were then loaded on to ore ships. During World War II, it was the chief supplier for the US Army’s Alaska Highway construction project. It switched from steam to diesel-electric in 1954. When world metal prices plummeted in 1982, the mines closed, and the WP&YR ceased to operate. The railroad needed to diversity to survive. It encompassed wharves, stage lines, paddle wheelers, hotels, aircraft, buses, pipelines, trucks, and ships. The WP&YR pioneered in 1955 the “Container Route” - the movement of containers by ship, trains, and trucks. In 1982, It shut down as a fully integrated transportation company. 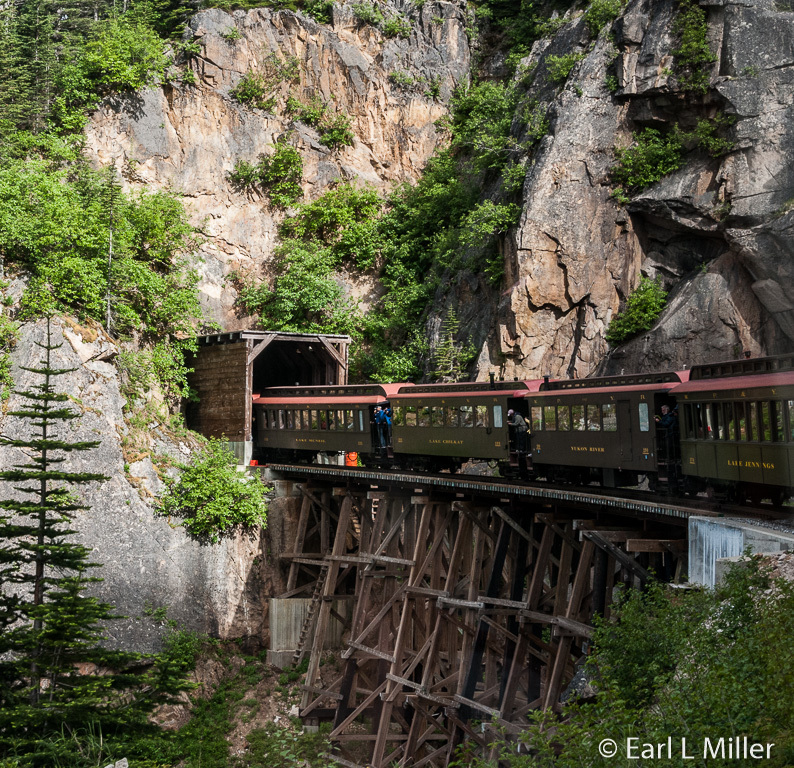 It became a scenic railroad in 1988 between Skagway and White Pass Summit. In the 1990s, it extended to Bennett and to Carcross in 2007. The train now runs from May through September following the cruise ship schedules. 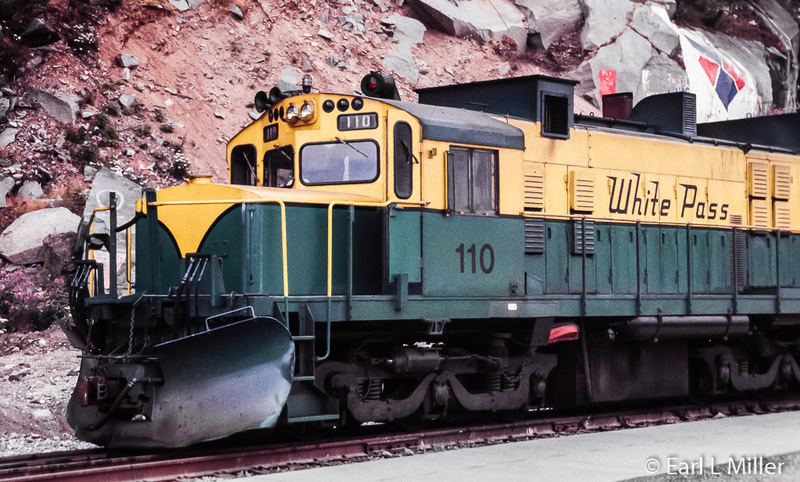 The WP&YR has 20 diesel-electric locomotives, 83 restored and replica passenger cars, and two steam locomotives. The diesel-electric locomotives are American Locomotive Company and General Electric units from 1954 through the 1970s. All have been modernized. The steam locomotives are Baldwins 2-8-0. Engine No. 73 dates to 1946 while No. 69 was manufactured in 1908. Steam trains run on Mondays. Fridays, and Saturdays. The passenger cars are named after lakes and rivers in Alaska, the Yukon, and British Columbia. Their average age is 43 years old. Lake Emerald, the oldest car, was built in 1883 and is on the line daily. Lake Tutshi, 1893 vintage, was in the Universal Studios movie “Diamond Jim Brady” in 1935. In 1959, the Lake Lebarge car carried Queen Elizabeth II and Prince Philip on a royal tour out of Whitehorse. 2.0 This is the home of the maintenance shops where the railroad repairs and restores its engines and rolling stock. 2.5 Gold Rush Cemetery - historic cemetery where gold rush criminal Soapy Smith and the town hero, Frank Reid, who killed him, died in a shootout. 6.9 Rocky Point - Great for photos. 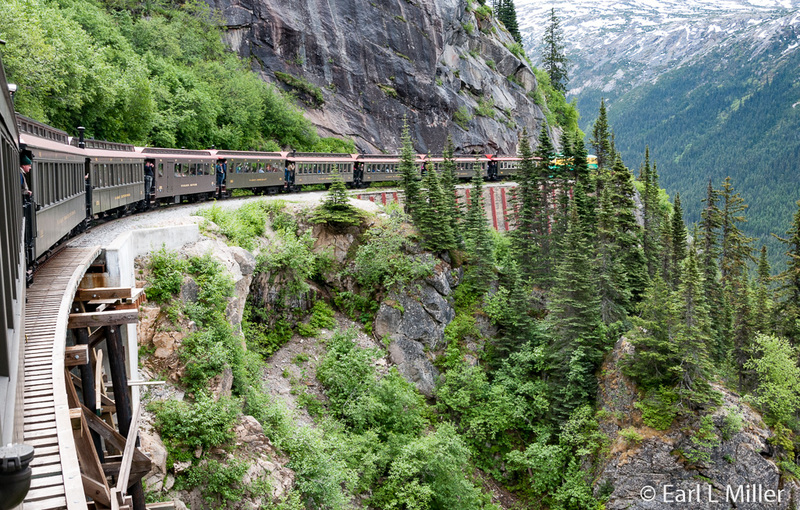 It’s an excellent view down the lower valley to Skagway with Mt. Harding and Harding Glacier in the background. You’ll see your cruise ship from here. 7.3 Brackett Road - The wagon toll road that Brackett established. This is the whirlpool section of the river. It is grey because of all the granite. 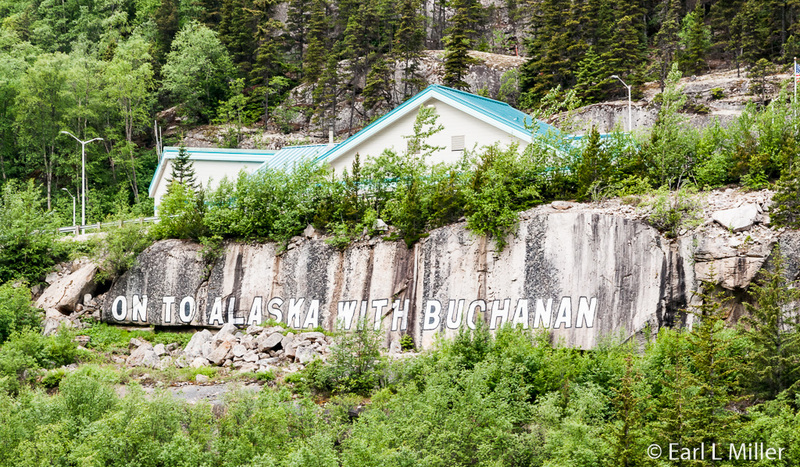 8.8 Buchanan Rock - In 1922, George Buchanan, a coal baron from Detroit, started sponsoring boys on annual trips to Alaska. The Buchanan Boys Group repaid him by clamoring across the canyon and painting their slogan on the canyon’s far wall. 10.4 Black Cross Rock - August 3, 1898, two railroad workers and their pack horse were buried, in a blasting accident, under a 500-ton granite rock. The black cross marks their resting space. 11.5 Bridal Veil Falls - This falls cascades 5,000 feet over rock before joining the river below. Keep an eye out for a trestle bridge near this location. 14.0 Glacier Station - The Railroad section crew lived here at one time to maintain the track. It was also a stopping place to give uphill grade, steam engines water. Headed to the Summit, this is the steepest part of the line. 17.0 Inspiration Point - It provides a great view of the Lynn Canal, the longest and deepest fjord in North America. Another photographer favorite. A resident mountain goat herd is often seen on the alpine slopes above the White Pass trail. 17.5 Dead Horse Gulch - This was where more than 3,000 pack animals died through neglect and overloading by prospectors during the gold rush stampede of 1898.You can still see bleached skulls at the gulch’s bottom. 18.6 Steel Bridge - Constructed in 1901. When it was built, it was the tallest cantilever bridge in the world at 215 feet. 18.8 Tunnel - In 1969, this tunnel was driven through the mountain with a new bridge replacing the steel bridge due to new locomotives and increased tonnage. 19.3 Trail of ‘98 - You can see the remains of White Pass trail as the train emerges from the tunnel. It is no longer hiked. 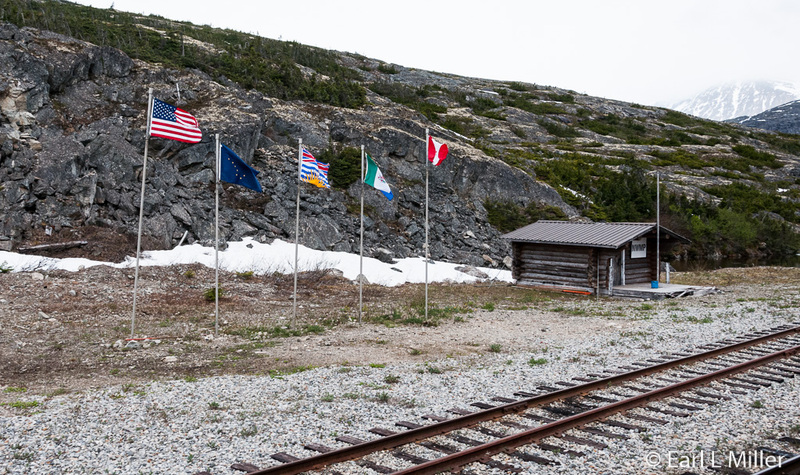 20.4 White Pass Summit - The flags of the countries, state and province mark the US/Canadian border. Mounted police waved on the prospectors who had the ton of supplies needed for a year to survive in the goldfields. 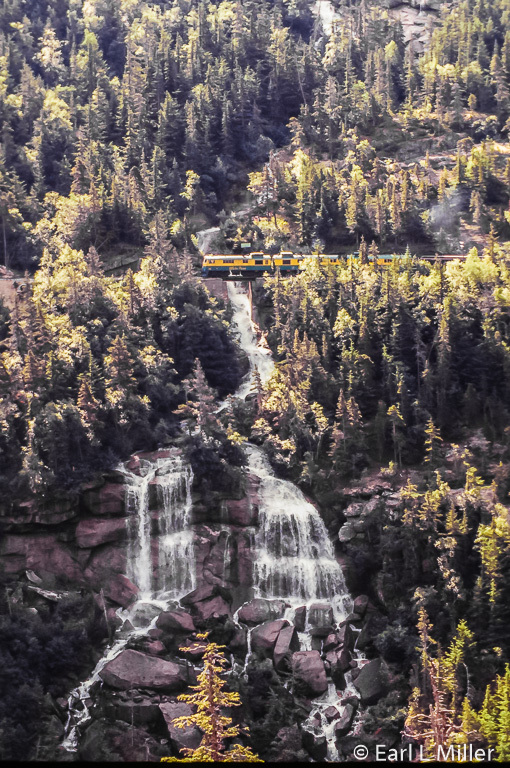 As the train climbs to the Summit, you’ll see different kinds of landscaping. At 800 feet, you’ll see deciduous trees such as paper birch and cottonwood. At 1500 feet, it changes to evergreens such as Western hemlock and Sitka spruce while at 2,000 feet you’ll enter a subarctic tundra. One advantage for booking the train excursion from the cruise line is that you board it on the dock immediately across from your ship. Upon your return, you’ll want to book the shuttle to transport you to town. The cost is $4 per person round trip. Take time to visit the headquarters of the Klondike National Park at Second and Broadway. It’s open from 8:30 a.m. to 5:30 p.m. from early May to late September. You can watch a free 25-minute movie on the gold rush on the hour, except 10:00 a.m. At 10:00 a.m., you can attend a free 30-minute ranger talk. The building was the WP&YR’s former depot. The park service leads a 45-minute ranger tour of sites in Skagway’s Historic District. These are available at on the hour, except noon, from 9:00 a.m. to 3:00 p.m. on weekdays and 10:00 a.m. and 2:00 p.m. on weekends. 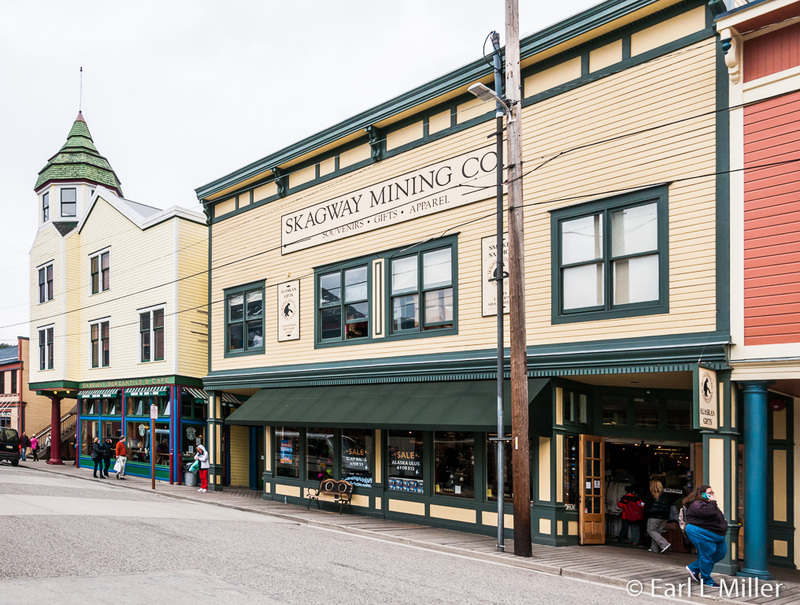 Walking around Skagway, you’ll notice many historic buildings. Captain Moore, the town’s founder, and his son, Ben, homesteaded 160 acres. The 1887 cabin that belonged to the Moores is Skagway’s oldest structure. In 1896, Ben and his wife, Minnie, moved to Skagway and lived in the one-room cabin for a short time. In 1897, the family built and moved to their wood frame home directly in front of their cabin. The National Park Service purchased the properties in 1977. The Moore House and Cabin are open daily from 10:00 a.m. to 4:30 p.m. at Fifth Avenue and Spring Street. The Mascot Saloon, on Third and Broadway, is a post gold rush saloon museum restored to its 1905-1916 appearance. Dating back to 1898, it was one of more than 80 saloons in town. Prohibition closed it down in August 1916. It later served as a drug store. Many of the buildings in its block served as ticket offices for steamship lines during the gold rush. It’s now owned by the National Park Service and has on display antique beer bottles from Coors and Rainier Brewing. It is open 8:30 a.m. to 5:30 p.m. The Golden North Hotel, built in 1898, was considered “the hotel” of its time. It provided food and lodging to some of the 1,000 prospectors passing through each week. There are stories that rooms 23 and 14 may be haunted. It closed in 2002. 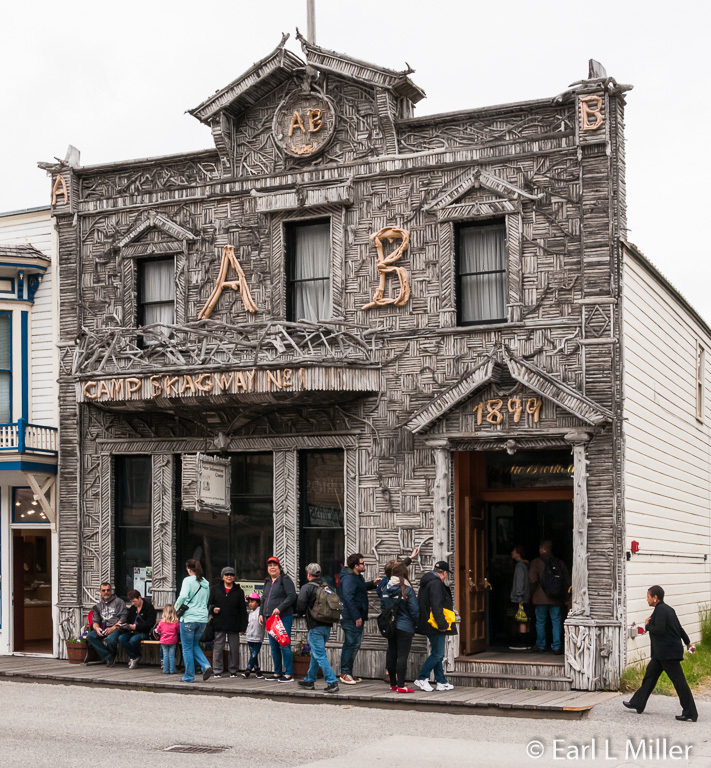 The Arctic Brotherhood Hall’s facade was built in 1899. In 1900, the Brothers added a facade of driftwood and sticks shaped into a mosaic of letters, gold pan, and square patterns. It consisted of more than 8,800 pieces of driftwood collected from local tidal flats. The Hall was a fraternal lodge similar to the Elks or Moose. During the gold rush, Its membership grew from 11 to more than 300. It provided mutual assistance, friendship, and social interaction. Its last member was inducted in 1923. Inside is the Trail of ‘98 Museum featuring gold rush relics. Dated 1899, it’s the most photographed building in Alaska. 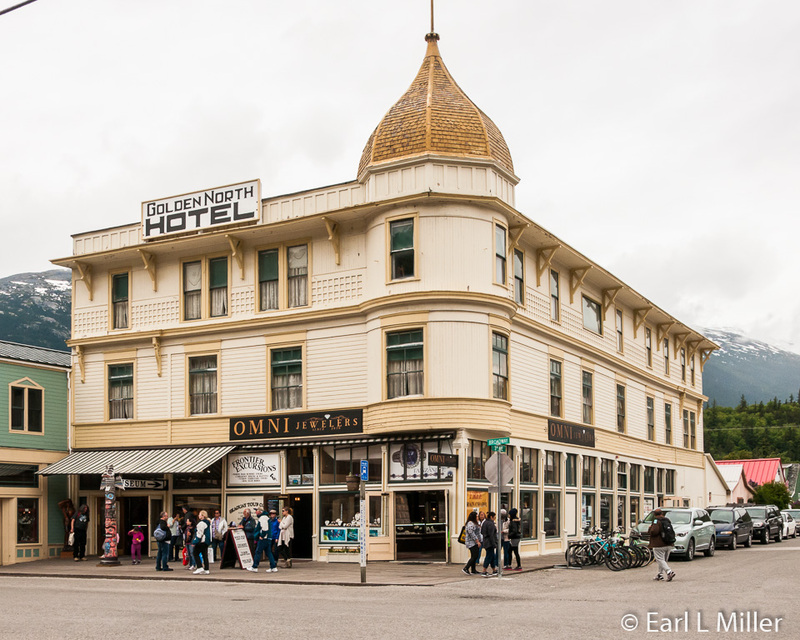 The lodge is located on Broadway between Second and Third Street and is now owned by the city of Skagway. 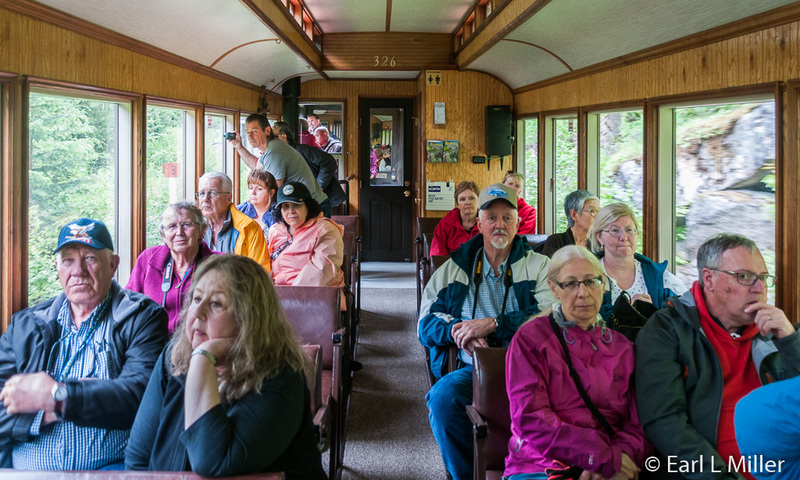 For a novel way to get around Skagway, you can travel in 1927 vintage street car to see the sights and learn Skagway’s tales. It’s a 90 minutes tour running May through September, at 8:30 am, 10:30 am, 1:15 pm, and 3:15 p.m. from the pier and is one of Millennium’s excursions. 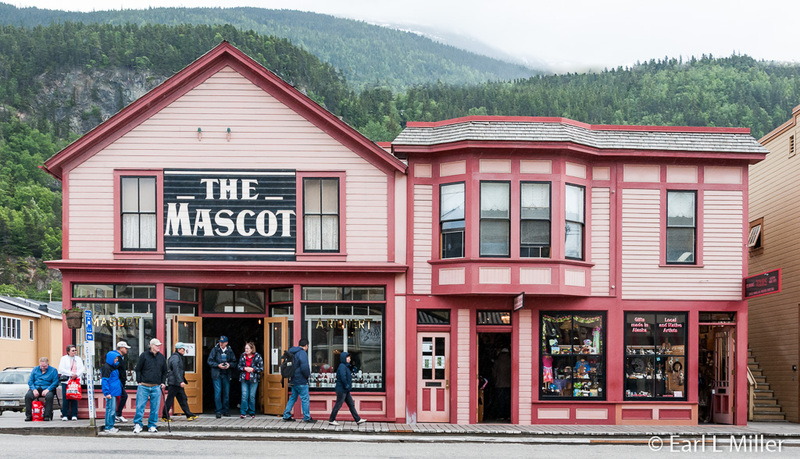 Costumed conductors take you into the Klondike Gold Rush National Park and Historic District, to the Gold Rush Cemetery, past Sarah Palin’s early childhood home, along the Skagway River Valley, and for a panoramic view at a scenic overlook. Cost is $49.75 for adults and $29.75 for children.